As if giving birth weren't enough, this photographer chose to shoot her own birth photos...and the results are pretty incredible. More and more women are opting to hire professional birth photographers these days, but Lauren Chenault decided to put her own twist on the trend. As a professional photographer herself, Chenault understood the importance of capturing the big moments—and she also realized that she could take charge and tell the story of her baby's birth herself. 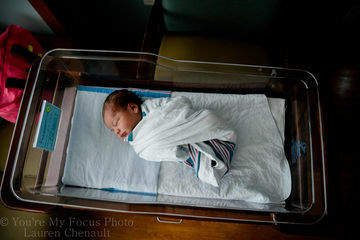 Chenault made headlines after she photographed her own baby's arrival. It's a move the mother of two considered for her first birth as well, but ultimately she held off until she welcomed her second child. "I didn't photograph my first because I didn't know I would have to hold my own legs, that's why this time I came prepared with friends to help me out," Chenault told Fit Pregnancy. "I photographed it because it's awesome that us women can grow a human inside us and then push it out, and I wanted to document it. And now I have an amazing photo of the first seconds that my son [Kai Arthur] was born." There are some pretty obvious benefits to shooting your own delivery (and we're not just talking about the money you save by not hiring a birth photographer!) 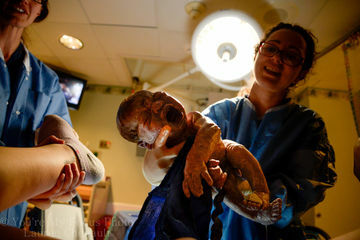 But does photographing while giving birth help moms take their minds off the pain of contractions? According to Chenault, not so much. "I really wasn't focused on the camera at all. It was resting on my chest and I just kept clicking," she said. "[But] having all my closest friends in the room really helped take my mind off the pain." Chenault didn't shoot the entire time she was in labor—she chose not to click away while pushing. "My friend Wendy who was holding one of my legs said 'get your camera ready he's coming,'" she says. "I couldn't have done any of this without the help of my husband, Byron, and my closest friends." 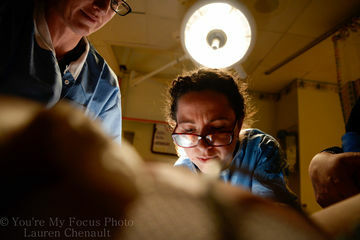 But while Chenault's photos are incredible—how amazing is the effect of birth photos taken from that vantage point?—the multitasking mom pointed out that photographing one's own birth isn't as easy as she made it look. "It's definitely a challenge if you don't know what you're doing," she said. "My doctors said I had a very easy birth so I'm not sure that some people would be able to do it. I wasn't in pain at all thanks to the epidural." Would you consider DIYing it?